When my local Walmart Supercenter opened, I had to check it out. Getting everything from groceries to electronics under one roof for the lowest prices seemed like a pipe dream. The store is known for its low prices and savings guarantees, and it didn’t take long to realize Walmart beat the prices of most items I purchased regularly, from health and beauty supplies to bananas and bread. Once I started shopping regularly at Walmart, I stopped taking for granted that their prices were the lowest. Instead, I found ways to capitalize on their low-price guarantee and discovered other savings strategies that help lower my grocery bill. 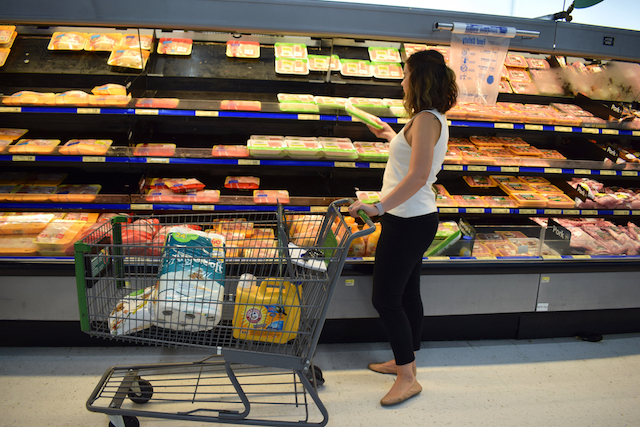 Here are eight ways I save money when I shop at Walmart. One of the simplest ways to save money at Walmart (and a ton of other retailers) is to use a cash-back app like Ibotta. The free app gives you money back on your purchases for uploading a photo of a receipt showing that you bought certain items. Before your next Walmart shopping trip, download the Ibotta app and check out the available offers. For example, right now you can score 25 cents back just for uploading your receipt. Other offers include $1.50 back on Hefty trash bags, $2 back on Scott paper towels, $2 back on Clorox laundry detergent and 25 cents back on any bacon purchase. When you get home, just scan your receipt and the money will appear in your account within 48 hours, which you can cash out for gift cards or a PayPal deposit. Sign up through this link and you’ll get a $10 welcome bonus. You can also read our Ibotta review to find out more about how it all works. Update: Walmart has changed its price-match policy in some stores, but not all, of its stores. We have details in this post. Walmart will price match any current published sale. All you need to do is bring in the ad and show it to the cashier. If you make your shopping list ahead of time, you can check local ads to find any better deals. Instead of driving to multiple stores, save yourself travel time and gas money by simply bringing the ads with you to Walmart and getting what you need there. Don’t stop there, though. Walmart will also match online prices at specified online retailers, including Walmart.com. Simply mention the advertised online price and the site where you saw it, and the cashier should make the adjustment for you. Don’t forget to compare prices on things you might not normally think to price match, like groceries, deli and bakery items, and health and beauty supplies. If you’ve been comparing prices in your local Walmart store to those online at other retailers and find another store sells the item for less, Walmart will match the price. But sometimes even Walmart’s own online prices are cheaper than their in-store prices. If you don’t want to do an in-store price match, order the items online and choose to pick them up. Most Walmart items sold on Walmart.com are available for pickup within 24 hours (and often on the same day). Simply put the item in your online shopping cart, select Free Pickup and choose your store location. Walmart’s app allows you to make a shopping list, check in-store and online prices and availability, look at the weekly ad and more, saving you time and money in the process. One of the best and easiest ways to save money with this app is the Savings Catcher. Simply scan your receipt using the app, or log into your account online and enter the receipt number, and Walmart will do all the work for you. They’ll compare prices at local retailers, including current advertised sale prices, and if they find a lower price, they’ll credit you the difference on a gift card. Even better, you’ll get double the Savings Catcher Reward Dollars when you redeem them to your Bluebird Card. Walmart changes its prices and marks down items throughout the week, according to a recent consumer data report covered by Lifehacker, making it difficult to pinpoint the best day to snag clearance and sale items. On the bright side, that means you can get good deals any day of the week if you know where to look. When you’re not in a hurry, spend some time browsing your local store and become familiar with the areas where each department displays its clearance stock. Sale items are often placed in the back of a department or on end caps to force you past the full-priced merchandise in that section of the store. Sometimes they’re displayed with large “clearance” signs, but other times the sale items are a bit less conspicuous, and their locations can vary by store. Don’t forget to look in the grocery, household cleaners, and health and beauty departments. You’ll usually find clearance sections with discontinued items or older models marked down significantly. Just because you expect Walmart to have the lowest prices doesn’t mean you can’t save even more by using coupons. Check couponing websites, the inserts in your Sunday paper and even Walmart.com for coupons that can save you big bucks on items you’re planning to purchase. If that sounds overwhelming, here’s a system to keep your coupons organized. While Walmart doesn’t double coupons or allow coupon stacking, they will give you cash back if the coupon is for more than the item you’re purchasing. For example, if you have a coupon for $2 off your favorite shampoo, but the item is on sale for $1.50, the cashier will apply the remaining $0.50 to another item in your order. If you’re not buying any other items, he should give you back the $0.50 in cash. If you’re looking for the best deals on meat and other perishables, try setting your alarm clock a little earlier than usual. In my experience, stores usually mark down meat and produce close to their “sell by” dates in the morning. The exact time can vary by store, so check with the managers of your store’s meat and produce departments to know when you should be shopping. Another department to check early in the day is the bakery, where yesterday’s baked goods will usually be marked down for a quick sale. There’s nothing wrong with yesterday’s bread or muffins, and if you’re not going to use them right away you can always freeze them. If you do find that a loaf of bread is a little stale, you can always revive it in the microwave or oven, or with a little celery. While Walmart’s prices are already quite low, I’ve used these strategies to lower my grocery bill even further. If there are other techniques you use to save more money on your Walmart bill, I’d love to hear them! Ami Spencer Youngs is a freelance writer and yoga teacher, raising her career alongside two boys under three. Learn more about her life and her writing at writingherlife.com or on Twitter at @writingherlife.